After a good night at The Bush Inn, good beer good food and a nice room we can recommend if you’re in the area you visit for refreshment of some kind. The breakfast was excellent, with locally grown or breed ingredients. We spoke to a couple from New Zealand who where spending several moths in Europe with most of their time in the UK. We set off around 9:30, and visited the church St Morwenna and St John the Baptist, this time we took a look inside and you should see some photo’s on the images page. There are lots of referencing sea farers and in particular a figure head which used to reside in the graveyard above those who died from the wrecked brig Caledonia, there is now a replica in the churchyard with the original figure head inside the church. We walked over some of the coastal path we had covered yesterday but it was only a short stretch so nothing too bad. The weather was due to be showery but the sun was again shining through a mix of thunderous and fluffy looking clouds. Again you’ll see the how the day looked in a lot of the pictures. We found our way to Tidna Shute and Higher Sharpnose Point (link) to walk including Higher Sharpnose Point), there used to be a Coastguard lookout here, in-fact the remnants are still there it’s just not used any more. Heading on toward Stanbury Mouth where if the weather permitted we had intended on going down to the beach, unfortunately it didn’t, the bright weather and high cliffs gave some spectacular views and some good shots looking toward Bude’s GCHQ Radio Station (although not that close to Bude). We took a bit of a wrong turn at the radio station, or to be more accurate we didn’t turn, right in-fact but retraced our steps when I’d spotted after a quick check on the Ordnance Survey Mapping App I use on my iPhone, a cracking app which I use on our iPad also, and I use it to show the overview map at the bottom of each blog post. From Duckpool we headed back uphill toward Warren Gutter and also Sandy Mouth I had decided in my own mind that although it doesn’t mention being able to walk from Sandy Mouth to Bude on the beach, that this was exactly what we would do if the tide was right. We took a deluxe hot chocolate (yes we pushed the boat out) at the Cafe at Sandy Mouth, at around 1pm the tide was due to be at it’s lowest and 2:30pm, so at 1:30 we headed down from Sandy Mouth along the beach toward Bude, in fact a number of people were also doing this, though they seemed to be locals also taking their dogs for a walk. Anne came across some structures on some pieces of old ship wreck and some rocks which we had never seen before, on further investigation it seemed that these were created by the Sabellarie Alveolata Honeycomb worm I took some whots which can as usual be found on the images page. We wandered into Bude via the Sea Pool found our accommodation dumped our stuff and headed back out for a wander around Bude and to find some Fish & Chips, in fact that’s a lie we knew exactly where to get them from after a previous visit, we also afterwards found a local pub before heading back to the Palms B&B for a good rest. 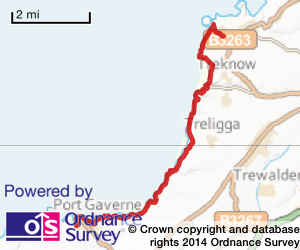 12.53 miles Distance, including extra walks to beaches and to the ends of any points we visited. Total time out including stops photo opportunity, enjoying tea and cake, 5 hours 16 mins. Total this week 11 hours 01 mins. Total walk time out 84 hours 48 mins. An extra piece of info from my Fitbit total Steps = 33,090 including extra walks to beaches and to the ends of any points we visited.